A somber memorial service will take place in the halls of Asgard after the Mighty Thor makes the ultimate sacrifice. 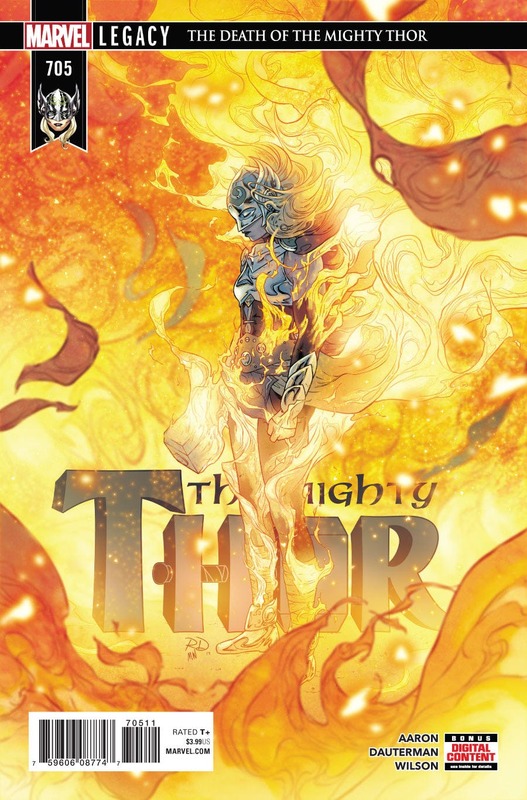 Jane Foster’s time as the Goddess of Thunder has come to an end when she defeats Mangog and sends Mjolnir flying into the sun. She goes out on top of the Fantasy Comic League, earning 12 points and her first “Hero of the Week” title of the year. She also hits for the cycle in her solo title. Iron Fist has his best week when drafted in the League. His Damnation tie-in benefits only him when none of the other Midnight Sons appear in his book. Danny scores seven points in second place. Doctor Voodoo has the next best performance out of the damned crew. His continued team-up in Avengers, plus Damnation, gives him six points in a five-way tie for third place. Rogue, another six-point hero, takes a break from leading the Avengers but keeps her weekly appearance streak alive after joining up with the X-Men Gold team. Cable and Amadeus Cho score six points in their solo titles while Moon Girl gets her six in the Monsters Unleashed finale. Another five-way tie rounds out the top heroes of the week with five points. Three of the characters appear in Damnation, while the other two face off in Avengers. Wonder Man risks his humanity to confront a character who continually struggles with his, the Immortal Hulk. Captain Marvel and Hawkeye remain under the sway of demonic possession while Johnny Blaze may be cured of his, at a fatal cost. Doctor Strange continues to underperform in his own event due to demonic possession. The original Wolverine makes another cameo appearance at the end of the Incredible Hulk book and the top three heroes of the 2017 League – Peter Parker, Deadpool and Old Man Logan – all fail to appear in the twelfth week of the year.